Sufong lives in Shanghai, a large city in China. Her father owns a restaurant that is well known, especially since her family has helped the local police arrest a couple of criminals. But the question remains whether her father will be able to keep his good name, since Sufong came in contact with some Christians who, in secret study the Bible and keep secret church meetings. Sufong does not dare to speak of this at home, until the Lord becomes the most important in the life of her parents. Sufong is a ten-year-old girl who lives in China, in the city of Shanghai. Her father's name is Waihong Chang. He has a successful restaurant called The Yellow River which is known for its very fine food and service. Often tourists, businessmen, and sailors can be seen coming to his restaurant. The boss in the kitchen is Chen the cook. Chunwang is the server of the food. Sufong has a three-year-old brother, Chi-Pin. He is active and requires much of Mother Miao's time. One morning Sufong gets up and with a sleepy face looks through the window. The street is filled with pedestrians and people on bicycles. Cars are rarely seen. Sufong makes a face at her red uniform. All the girls wear a red dress with a white collar when they go to school. She hates that dress. As soon as school is out she will take off the dress and change into a skirt and blouse, which will certainly not be red. But first, she has to do her tai-ji exercises. She does these every morning when she wakes up. These are the exercises of the five animals: the dragon, the tiger, the leopard, the snake and the common crane. She has been taught that the dragon will give spiritual powers, the tiger strengthens the bones, the leopard brings strength, the snake brings flexibility and the common crane exercises the muscles. Years ago the tai-ji exercises were used to make one a better fighter. Now they are used to start the day out refreshed. That is not strange, because everyone in China does these exercises. Even in the middle of town squares and in city parks people are serious about doing these tai-ji exercises. Sufong does her very best, too. At school she is taught that these exercises are very important. After about ten minutes she is finished and then hurries to the bathroom. A little while later she appears, neatly dressed, in the kitchen. "Ni zao," (good morning) she says joyfully. Mother Miao is combing Chi-Pin's hair. He makes a big fuss because it hurts. Sufong laughs at him, which makes him even more upset. With a swoop, Mother sets him on his chair, and immediately he stops his crying. "And now eat!" Mother says. Every morning she has the same problem with him. Sufong tries to cheer him up, and before he realizes it, his plate is empty. Sufong is also finished. She notices that she has a little time left before she has to go to school. She quickly goes to the front of the building, where the restaurant is located. There Chunwang is straightening the tables and chairs. "Hi there, Sufong. Are you ready to go to school again?" Chunwang asks. She pulls up her nose and sulks. "I don't want to go." "It's good for you to go, Sufong!" She smiles and says, "May I help you with something?" "Not now, Sufong, but this afternoon you may fold the napkins and place them on the tables." "Yes... that will be fun! I will do my best in school today, Chunwang!" "I don't expect anything else." "Are we expecting important customers, Chunwang?" "You're getting nosy, Sufong, and that's not nice. Look at the clock!" Mother and Chi-Pin watch her go. "See you this afternoon, Sufong!" It is a ten-minute walk to school. When she rounds the corner of the street, her friend Lihua is waiting for her. She is smaller than Sufong, although she is a year older. "Don't you think it's warm outside?" Lihua sighs. Sufong nods. "Yes, even the wind is warm." "I don't feel like going to school. Shall we play hooky?" "Hey, you don't mean that, do you?" Sufong asks and she looks at her friend with a frown. "Forget about that idea, because nothing but trouble will come of it!" "Are you coming again tonight?" Lihua asks. "Haven't your father and mother noticed anything yet?" "I'm glad they haven't, or I'm sure they would never allow me to go to your house again!" Lihua's parents are Christians. Actually, no one else is supposed to know that. It is a secret between the two girls. Twice a week people gather at Lihua's parents' house. They listen to the reading from the Bible, and sometimes they listen to the radio when a secret radio station broadcasts a religious program. Nothing of this sort is allowed, because religious church services are forbidden in China. That is why she cannot speak about it. 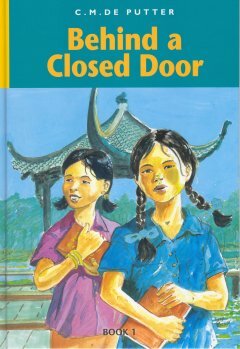 Sufong is good at keeping a secret, and no one will hear from her about the secret meetings held at Lihua's parents' house. The morning passes more quickly than she had thought, and before long Sufong hurries home. She knows that she may help Chunwang fold the napkins, and perhaps she also may set the tables! She has to do her work very precisely because Chunwang notices everything. He is very particular, and that is good for their restaurant. Many times she hears her father speak well of him. There is The Yellow River restaurant already. She climbs the few steps and opens the door. Since customers are present, she must enter softly and be friendly. She greets the people with a slight bow and walks into the kitchen, where Chen is stirring in a pan. "Hi, Sufong. Are you out of school already?" He looks at his watch. "Is it so late? Time seems to fly," he mumbles. His white chef's hat is cocked to one side, covering one ear. When that happens, you know he is busy. Sufong sometimes jokes about it. Then Chen acts as if he is angry and says, "Just wait," and chases her with a big wooden spoon. Sometimes she is not quite fast enough for him and receives a playful spanking with that big wooden spoon. Now she had better not try that because Chen says, "Right now I have no time to joke around, Sufong." She sits down at one of the tables and looks at Chen. He places a hot bowl on the table in front of her and says, "Taste some of this!" After a few mouthfuls, Sufong says, "Chen, this tastes delicious!" The chef smiles. "I know that, but I didn't think you would like it." "You know better than that, Chen. What food don't I like?" Chi-Pin comes charging in now, followed by Father and Mother. "Sit down at the table, you rascal." "Sufong, you know where the napkins are. Take the pink ones." Chunwang pulls a few tables together. A table must be reserved for eight people. They must be important people, since they have ordered so much in advance, thinks Chunwang. The manager, Waihong Chang, had taken the order in astonishment. "Wow.... " he had mumbled. He had immediately shown the order to the chef, who had calmly said, "Let them come. I'll make sure that everything is top quality." Chen has taken care that everything necessary is available in the kitchen. He thinks they must be very rich people! All the others think the same thing. The guests are expected to arrive at five o'clock. Chunwang walks around the table once again... Yes, everything is ready! Chen looks over the dishes he has prepared with the eye of an expert. "Everything is in order," he says to himself. Then the guests start arriving, and Waihong Chang, the manager of the restaurant, personally escorts them to the reserved table. From the kitchen, Chunwang and Chen have seen the guests come in. To their surprise, these people do not look very important! Some of them even look sloppy. Waihong Chang comes into the kitchen. "Something just isn't right," he whispers loudly, and he says to Chunwang, "Keep an eye on them." "You can count on that, boss." Chen makes sure everything is ready, and Chunwang serves the guests. The manager walks back and forth and helps other customers coming into the restaurant. At the same time he keeps an eye on the reserved table. The guests are busy in conversation, but as soon as he approaches their table, they stop talking. One of the strangers has a piece of paper with him which everyone reads in turn. A mysterious atmosphere hangs over the table. Chunwang serves them as if they are the most important people in all of China. That is his specialty. He almost overdoes it. "Does it taste good, gentlemen?" "Shi, shi," (Yes, yes,) the men nod in agreement. "Please, in a moment the fourth course will be served to you." It is close to eight o'clock when they all leave. Waihong Chang says in surprise, "I just do not understand it. They paid for the food in cash, and gave a generous tip, as well. Mark my words... there's something strange about that group." Chunwang agrees wholeheartedly. That evening Chunwang reads a note that he has found under one of the chairs.